Sydney Paules is a 6th grade student at Pikesville Middle School. She is an only child who lives with her mom, dad, three dogs, two mice, and a tank full of fish. Sydney enjoys participating in after school clubs like the Guitar Club and Environmental Club. She also stays busy swimming competitively three nights a week and competing in gymnastics two nights a week. 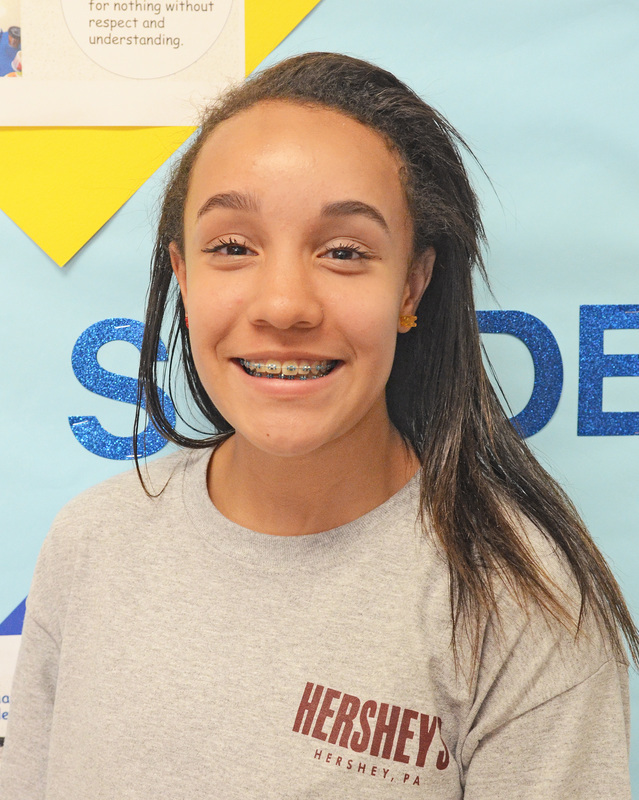 Although she doesn’t have much time for television, her favorite show is “The Walking Dead.” She likes math class the most out of all of her classes and loves having her own device so she doesn’t have to borrow her dad’s. ​I have learned a lot while using the computers this year. This includes going onto BCPS One to make Power Points. One of my favorite things to do this year was to use Fresh Paint because it let me express myself by using art digitally. I learned how to make Power Points and customize them according to the topic that I am working on, which was really cool and entertaining to watch when I was presenting. If I had any advice for the upcoming students who are using the computers it would be to not abuse the amount of freedom they let you have on the computers. Also, I would say to appreciate how lucky we are to have the computers because it is a once in a lifetime thing to be one of the first Lighthouse schools. I loved my first year computer experience and can’t wait to use the computers again next year. Since October I have been able to get around my computer so much better! My teacher taught us how to use this tool on Microsoft that allows us to compare and contrast and represent cause and effect a lot better. The tool is called SmartArt. The other day in math, we used this website called Class Flow. It allows us to have a discussion digitally and we all have input that everyone can see about the question or topic. Lately, I’ve noticed that learning has been a little different. By different I mean the teachers don’t stand in front and talk as much. We participate in a lot more group work and work as a class or with our friends if anyone has a problem or questions. I am so much more comfortable with using the devices now! I learned how to take advantage of all the resources provided, like Discovery Education Board Builder. Instead of putting together a big bulky board at home to display my project, I can simply go on to my computer and create one there. Using BCPS One was a struggle before because I didn’t know how to access the grade book or message my teachers if I had any questions. I now learned how to take quizzes online and even turn in assignments. We use OneNote in math class when I take notes for homework. It helps with my organization a lot because I don’t have to worry about losing papers. I can even use special effects on OneNote to make my homework look like it was done on real lined notebook paper! I can’t wait to learn more techniques and strategies that I can use on my Revolve. So we got new computers and we have had them for about 2 months now. There are a few things that I don’t like and there are definitely things that I like. One thing that I like is how we use them in class to do our work. I also like doing my homework on them instead of doing homework on paper which lose easily. I like the experience we are getting from using the computers because I am more advanced with technology and typing. Things that I don’t like about the computers are that sometimes my files disappear, and I can’t find them but I learned to save my files to One Drive and that problem got better. Another thing is that when we first got the computers I thought we were going to be able to personalize them and make them our own by changing the wallpaper and putting cute stickers on the outside of them, but it turns out we aren’t but we I figured out how to put design on my metro screen. Sometimes BCPS ONE can be slow at certain times of the day but I hear they are trying to upgrade to better handle all the people using it.